"I have had the pleasure of my maternity and newborn pictures be taken by Stephanie and I cannot express how amazingly talented she is! Both photo shoots could not have gone more perfect. She is professional but easy to talk to and makes you feel so comfortable. The photos came out absolutely stunning and the process of picking out your photos is organized and fun! Her pricing may seem a little high but you truly get your moneys worth and I rather pay a little more to get the photographs she provides. If you want stunning, long lasting photographs then Stephanie is the photographer to use!" "Our experience with Stephanie Ratto Photography was absolutely perfect! Not only is Stephanie's work amazing, she is just an amazing person to work with. My husband was deployed throughout my pregnancy, Stephanie was so flexible with us as his return home date was constantly changing and only a month before our son was due. Finding a photographer we felt comfortable with to capture the essence and beauty of this incredibly special time in our lives seemed like a stressful task, but after meeting with Stephanie we knew we were in good hands. She truly cares about the work she does and it definitely shows in the final product. The photos she took of our precious newborn are timeless. Stephanie was so patient and sweet with our son. She spent hours with us to ensure she captured all that we wanted for his newborn photos. We are incredibly happy and in love with our photos and are so thankful to have met Stephanie and been able to have her be apart of this special time in our lives!" "I can't express to you how important this was for me. 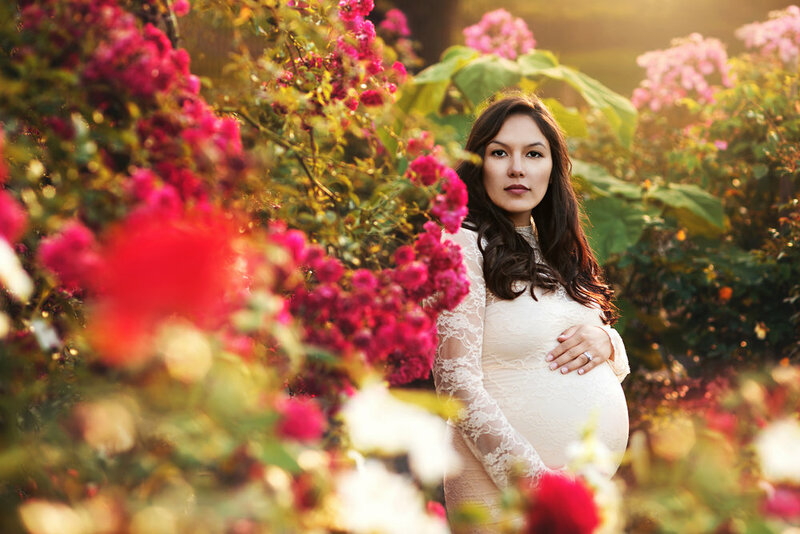 How wonderful I felt during my maternity session was magical. Working with you was so easy and laid back! Something that I was worried about was that it would seem stiff and too posed. It was the exact opposite with you as our photographer. We were able to completely be ourselves. The photos that are my favorites are ones that I could literally say you stopped time and captured every ounce of our love for each other within them. It's easy to forget about your significant other when you're expecting a baby, but you definitly reminded me of how in love with Ivan I am. To see him look at me that way again... I can't even tell you how greatful I am to have gotten the chance to have you capture these precious moments! I look at the pictures that you took months and months after the shoot and still get butterflies because every time I see them I remember how happy I am with my little family. They're beautiful reminders that love is truest beautiful! They're reminders that I am so blessed every day. Not every photo can make me feel that way! Thank you times a billion!"